a 316L marine grade Stainless steel case, a screwdown crown and solid caseback, a unidirectional divers bezel, an AR-treated domed Sapphire crystal and C3 Swiss SuperLuminova. The 40mm in diameter by 15.4mm thick case has a matte brushed finish with polished sides. It has been pressure tested to 30 atmospheres, the equivalent of 300m. Powering it is an automatic mechanical movement made by SEIKO Japan, the NH35a with 24 jewels, a beat-rate of 21,600 bph and a power-reserve of 41hrs. The watch is presented on a 316L Stainless steel Oyster bracelet (20mm tapered to 16mm) with a matte brushed finish, polished sides, solid end-inks and a double locking divers safety clasp with embossed logo. a little bit predictable but nevertheless nice features. I wonder how the watch manged to take the 3 years of development that Protos talk of? The Protos Dive Watch is priced 490USD – follow the link embedded, below for more details. What would you recommend as an alternative... working on the principle I can't afford the original and I won't buy a fake? I bought this watch and let me tell you it is beautiful and worth the $299 and then some! I have been wearing one for for close to 6 months, my general feeling is they are well made and reliable watches, lacking the luxury feel, but as a tool watch I feel it inspires confidence. I believe it cost me circa £280, a fair price in my opinion. 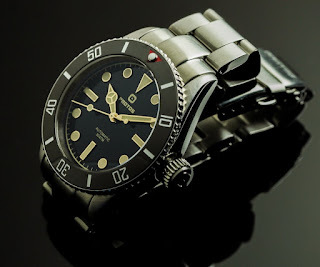 Is it a Rolex sub alternative, no, but the prices are oceans apart, and you get the look of a very costly 50's icon. Also it isn't an invicta.